The Sharp LL-191A has been out a few months now and, while it was very aggressively priced when it was launched, the street price has hardly dropped at all since then, making it quite pricey compared with the competition. 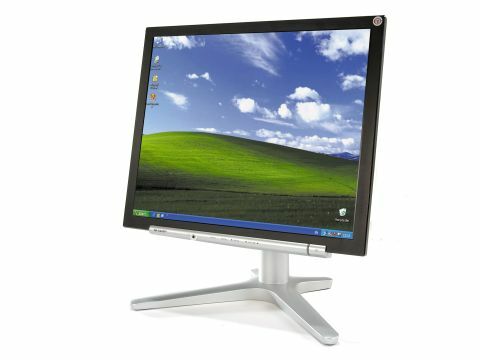 Even so, the eyecatching design suggests that the monitor is bang up to date and worthy of your cash. However, take a glance at the back of the panel and you'll notice that there's only an analogue video input. The Philips is the only other screen on test not to have a digital video input, but that monitor is over £80 cheaper than the Sharp. Another disappointment was that the Sharp was the only monitor we've seen recently that failed to calibrate itself properly with a single use of the auto-tune feature. Even after repeated attempts, the monitor failed to tune itself properly to the ATi Radeon X800 series graphics card we used, and we had to resort to manually setting the clock and phase adjustments through the less than intuitive on-screen menu. Once the manual calibration was completed, the Sharp performed well in terms of picture quality. The screen has plenty of brightness and contrast in reserve, making it suitable for vivid viewing, while colour accuracy is maintained when taming things down to ensure photo accuracy and calibration with printers. Indeed, this particular process is simplified by an accurate sRGB mode, which you can switch to from the Standard operating mode at the press of a button.